Are you looking for a great multi-purpose climbing toy for toddlers. The ECR4 Kids Tree Top Climb and Slide Play Structure could be just the ticket. For starters, it is designed for indoor and outdoor use so that makes it an all season toy. Great for the backyard in summer and inside fun for the winter months. This will become the focal point of your toddlers daily activities. Create some great family memories while at the same time keeping your little ones active and fit. Parents, you will love this easy to assemble and colorful structure. The treehouse theme and multiple uses will keep things exciting for your kids and their friends and it’s easy to maintain and keep clean. This fully functional climber and tree house features apple trees on both sides for a realistic tree and clubhouse feel. The toddlers can access the platform easily with the two climbing side ladders. When the kids need a break they can sit and read or have secret meetings on the sturdy bench at the back. Imagination, exercise and creative activity is what makes this an ideal set for your family. This is a toy that can become the meeting place for your kids and their friends and the great thing about it is that they can use it all year, the season doesn’t matter with this indoor/outdoor activity center. 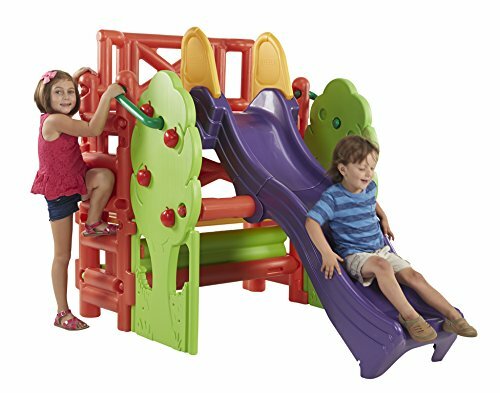 Two slide ladders for climbing and a fun colorful and wavy slalom slide will help your kids stay active and build their social skills. The sturdy back bench meeting area is a reversible piece that can become an active sand pit in the summer. This is an easy to assemble product that comes with everything that you will need and is designed for preschoolers. It is ideal for children from three to eight years old. It measures 78.75 x 49.2 x 54.7 inches and has achieved GREENGUARD (Gold) Certification for reducing chemical pollutants, improving air quality. This is a fun themed climber that doubles as a clubhouse and meeting area for your kids and their friends. Slide, climb, socialize and let their imaginations run wild with the ECR4 Kids Tree House Climbing Toy. The type of toy that creates a lasting impression and some great family memories. Check out more great climbing toys for toddlers here.